Hydrangea ‘Annabelle’, full name hydrangea arborescens ‘Annabelle’, is an exceptional variety of hydrangea. Instead of being the result of breeding programmes, ‘Annabelle’ was simply found growing in the wild in Anna, Ohio. This accidental discovery was then propagated by professionals, who made the shrub available to garden enthusiasts. When people discovered ‘Annabelle’, it gained popularity in virtually no time and became widely available. Hydrangea ‘Annabelle’ boasts gigantic flower heads (25cm in diameter) in addition to very large dark green leaves, which will make it a focal point in any garden. The showy, flat flower heads have a stunning white colour and last from July to September, however the colour of the flowers turns to bright green as the flowering season progresses. Hydrangea ‘Annabelle’ is generally tougher, more versatile and less demanding than the popular hydrangea macrophylla. ‘Annabelle’ can handle cold winters better than macrophyllas and responds well to pruning. It is very suitable for harsher climates, where macrophyllas may have difficulties growing. The flowers will appear season after season without requiring much help, except perhaps some additional support to keep the heavy flowers from bending to the ground. It is no coincidence that ‘Annabelle’ is the best known variety of arborescens. 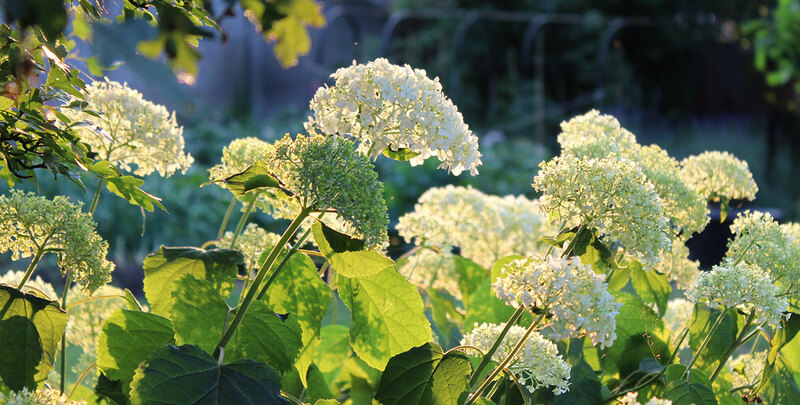 Very few gardening skills are required to cultivate a hydrangea ‘Annabelle’ and it can be planted in any moist, well-drained soil. Watering during dry periods can be beneficial and ‘Annabelle’ should be sheltered from cold, drying winds. ‘Annabelle’ is a versatile hedging plant, and can grow a lovely informal or even formal hedge, depending on how it is pruned. This hydrangea hedge can reach a final height of 1.5m tall when grown as a hedge or specimen shrub. Alternatively, hydrangea ‘Annabelle’ can also be planted in a pot, which will allow you to put it anywhere you like.